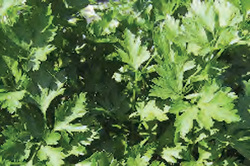 Site: Parsley likes full sun or light shade. Plant in a rich moist and deeply dug soil. Water during dry weather. Growing: Thin or transplant plants to 9 inches apart. Parsley must be protected in cold weather by covering with cloches or straw. Parsley can also be grown well indoors. Harvesting: Pick leaves for continued regrowth. Remove flowering stems as they appear, but a few can be left in the second season to provide seeds for self sowing. Culinary Uses: Curly leaf varieties are probably the most attractive for garnishes but the most flavorful are the Italian or flat leaf varieties. Parsley leaves have mild flavoring and can be added raw to salads. Finely chop and sprinkle over sandwiches, egg dishes, vegetable soups, fish and boiled potatoes. Add to spreads and sauces or cook to enhance other flavors. Always add toward the end of cooking time.